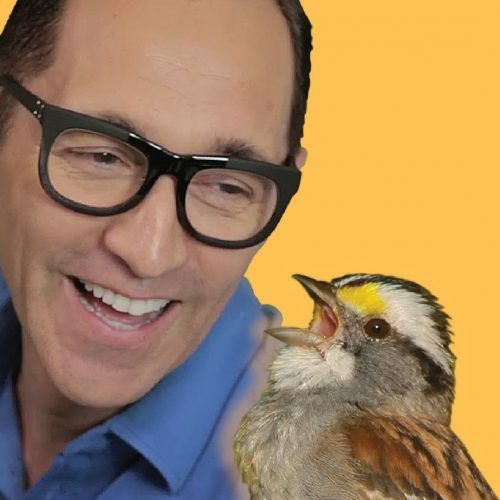 Explore animal sounds with Bird Academy’s BeastBox. Play the game that lets you be a wildlife DJ. Make your own music by mixing wild animal sounds with beatbox loops and unlock Beast Mode by adding five animals from the same ecosystem to the virtual stage. This game was inspired by wildlife DJ and beatboxer Ben Mirin, who travels the world collecting the voices of wild animals that catch his attention. Layering his own beatbox loops with his favorite animal voices, he makes music inspired by the ecosystems he visits. Bring animals from the same ecosystem on the stage together. BeastBox celebrates the voices of wild animals and the health of the ecosystems they depend on. There are a few different ways to play. Treat BeastBox as your own mixing board and create music from your favorite animal voices. Add together real wild animal sounds and beatbox loops from Ben Mirin to build endless combinations. For those who like puzzles, unlock ecosystems by bringing animals from the same habitat together on stage. Each time you do this, you unlock Beast Mode, where you can listen to a song composed entirely of sounds from the featured ecosystem, while controlling the moves of the animals as they dance. Learn about each animal and its habitat by selecting the info button hovering over each animal’s head onstage. This will give you the chance to see a photo and hear a field recording of the animal, and learn what ecosystem it lives in and how it communicates. This game is great for fans of music and wildlife of all ages. It’s useful in classrooms to teach about biodiversity and in music programs to get students excited about composition. Enjoy! 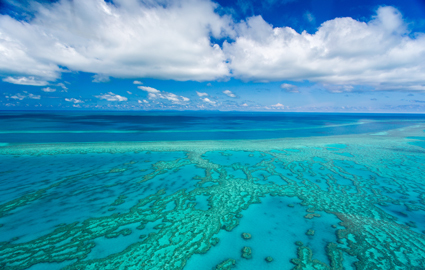 Visible from outer space, the Great Barrier Reef is as diverse as it is huge. It bursts with wildlife; each species plays an important role in balancing one of the world’s most complex ecosystems. Even as parts of this Australian gem die off as a result of warming waters, its diversity persists. Only 80 kilometers from the ocean, the Sonoran Desert in the southwestern United States gets more rain than any other desert on the planet—and the wildlife is prepared to take advantage of the bursts of moisture. In the Chesapeake Bay, freshwater and saltwater collide to provide special habitat for many species. The largest estuary in the United States, the bay is a shallow but vast 300-kilometer-long stretch of marshes, oyster reefs, wetlands, mudflats, and sandy beaches. Home to the tallest rainforest trees in the world, Borneo’s tropical forest ecosystem rises 18 stories above the ground. Every level of this Indonesian jungle overflows with unique native animals. The waters of the Okavango River empty not into an ocean but instead into the vast Kalahari Desert in southern Africa. A rare inland delta, the Okavango regularly floods creating pristine wetlands that are an oasis for thousands of species. The lowland rainforests of the island of Madagascar have been geographically isolated for 88 million years—and they show it. Amidst the flora and fauna inhabiting this sea-level forest, roughly 90 percent are species found nowhere else in the world. Ben Mirin is a sound artist, educator, and mammal with an impressive voice. Ben leads expeditions around the world recording animal sounds, samples their voices, and creates music that helps us understand and protect wild places. He is an Environmental Ambassador for the Cornell Lab. He lives and beatboxes in Brooklyn, NY. African savannah elephants are sensitive communicators that can recognize the deep bass rumbles of family members kilometers away. Female-led herds use a variety of distinct calls to communicate everything from location to emotional state. The largest animals on Earth are also the loudest—but their voices are so low-pitched that human ears can’t detect them (sped-up here). Blue whales use these strong, bass voices to keep in touch over more than 1,000 kilometers. Male blue wildebeest rarely resort to all-out fights for territory—instead, they engage in cordial conflict rituals. They lock horns, wrestle, and bellow their signature “gee-nu.” Once the males have established their territories females will choose from among their options. Bobcats are solitary carnivores that make all sorts of noises—some even sounding like birds. These wild cats can chirp, chortle, growl, and scream. When these sounds erupt within earshot it can be an eerie experience. The Bornean gibbon’s magnificent howl can be heard from all levels of the rainforest. Small family groups use this call to stake out their treetop territories. Females whoop with the most strength, sending their calls as much as a kilometer through dense greenery. Adult male Bornean orangutans make loud “long calls” that travel well through the dense forest. The subtleties of these calls are well understood by nearby orangutans. Small variations in the pattern and quality of the long calls signal the male’s identity and his state of excitement. Bottlenose dolphins use a complex series of whistles and squeaks to maintain their vibrant social lives. To help them map the ocean floor and to find food, they can also produce echolocating clicks at a blistering pace of 1,000 per second. Crrrunch! Parrotfish use their unusual beaklike teeth to grind algae and polyps from the surface of coral. This comes with a distinctive scraping sound that signals a beach in the making. Much of the sand you find on tropical island beaches is thanks to the grinding action of parrotfish. The Cactus Wren’s song sounds more like a revving engine than a melody. 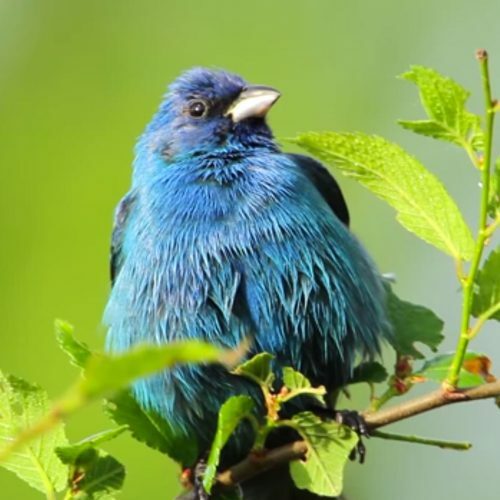 These birds also make buzzing calls atop shrubs to warn others of incoming predators like roadrunners and snakes. Sometimes nearby Cactus Wrens will join in the alarm calling. 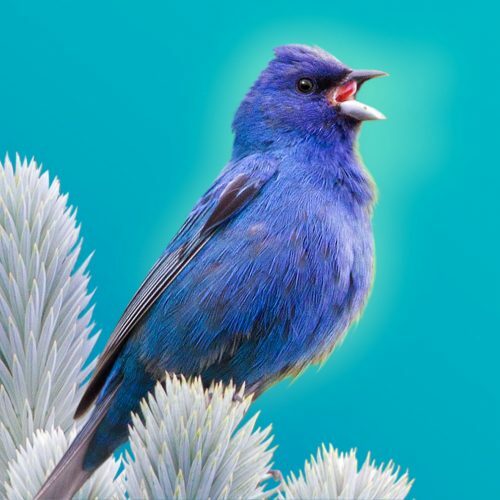 This small songbird uses fluting notes and a mellow low-pitched trill to announce its presence. The male Chestnut-winged Babbler can also flash his blue throat during song in what is thought to be a courtship display. Although katydids are hard to spot in a tree, they are impossible to miss once you know what they sound like. Katydids use their large, leaflike wings as an instrument to make bold staccato notes, but rarely to fly. On warm summer nights, males call in chorus to attract females. Shrieking howls pierce the night—is it an entire pack of coyotes? It could be, or it could be just two. When a pair of coyotes howl to mark their territory, they often sound more numerous to nearby listeners. Thanks to impressive camouflage, Eastern Whip-poor-wills can hide in plain sight—but once they open their beaks they’re more like lead singers than wallflowers. At dawn and dusk, they repeat their rousing “whip-poor-will” song for minutes at a time to claim territory. This large cicada species is one of the loudest insects in the world. With a wingspan of up to 17 centimeters, empress cicadas can make a deafening ruckus produced by vibrating chambers in their abdomens. Flitting in and out of sun-speckled canopy, the Gold-whiskered Barbet speedily whistles its signature “tehoop-tehoop!” The song reverberates through the lush forest during daylight hours, becoming slurred as the bird performs at peak speeds. The Gray Crowned-Crane stands out from its surroundings in more ways than one. This crane’s booming call is a fitting match to its eye-catching head plumage. Roosting in trees, pairs may honk in unison to strengthen their pair bond. When a chorus of “ribbits” erupts from the dark on a rainy spring evening, you’re hearing males trying to get the attention of nearby females. Each frog species has a unique call. Often the pace of the chorus speeds up as the outdoor temperature increases. There’s a constant crackling noise filling much of the world’s oceans. It’s the collective din of snapping shrimp, each using its oversized claw to create a sonic punch. They’re not doing it for the noise, though: the snaps produce high velocity water jets capable of stunning and killing prey. As dusk falls, a Hadada Ibis can be heard calling out its name during flight: “haaa-daaa-daaa!” These loud birds thrive in urban landscapes, annoying some and inspiring others to treat them as backyard pets. During humpback whale mating season, viral songs sweep the oceans. Scientists have observed that individual males change out phrases of their complex mating songs to fit what’s popular, revealing mass cultural shifts over the years. A small group of indris wake up in the treetops and begin their morning shout-outs. These calls are soon echoed by neighbors. Indri are relatively large for lemurs, with booming voices amplified by enlarged throat pouches. Snuffles, snorts, and a strong skunklike stench can only mean one thing—javelinas! These social herbivores travel in herds and use their scent glands and vocalizations to mark their group territory and keep in touch with family members. This fruit-eating wild parrot’s song is not very parrotlike at all. It sounds more like a songbird’s pretty notes than those squawking sounds you hear in movies. This bird makes a barklike call that sounds almost like a large rubber duck. This is a nocturnal sound. Like many owls the world over, the Madagascar Long-eared Owl is active at night, hunting for small mammals, lizards, and insects. Northern Mockingbirds are vocal wizards, able to mimic other birds, frogs, and squirrels—even sirens and ringtones. Males try to outdo each other during predawn performances. The best of them draw on hundreds of unique song types to win the vocal battle to attract mates. Instead of opening its beak to sing, the Red-fronted Coua keeps its beak closed and puffs out its throat for a series of staccato notes. This cuckoo species is a deep forest dweller with a red head and a blaze of blue around the eye. A Red-tailed Hawk makes a piercing “kee-ee-arrr” call when there’s an intruder in its territory. Marmots and prairie dogs sprint for cover when they hear one, and songbirds may mob the approaching raptor to distract the predator from active nests. This tiny iridescent bird throws its head back to sing its twittery song. The Souimanga Sunbird’s long curved beak opens and closes quickly, almost in a blur. The same beak is handy for gathering nectar from deep inside flowers. Like Morse code, the piping duets of Tropical Boubous signal information to mates and neighbors. Pairs can perform more than a dozen specific duets. Thanks to its dual-sided songbird voice box, if a partner loses its mate, it can perform duets alone. Some fish can sing, but they don’t use vocal cords. Atlantic croakers and weakfish are just two of the many saltwater fish that vibrate internal air sacs (swim bladders) to make deep, rumbling calls that sound more like cats purring than anything you might expect from a fish. Starting in the late 1970s and early 1980s in and around New York City, beatboxers, MCs, graffiti writers, and breakers collaborated to create an authentically American artistic movement: Hip Hop Culture. What started on the streets of New York has had a global influence on modern culture. Celebrating the birth of hip hop, BeastBox is set in a club in the early 80s and the characters pay tribute to the fashion of that era. Learn more about what was happening when beatboxing was invented by exploring rare photos, recordings, and party flyers from the early days of hip hop at the Cornell Hip Hop Collection. This is a musical planet with a diversity of wild voices to celebrate and protect. Many of the sounds in BeastBox come from the Cornell Lab of Ornithology’s Macaulay Library collection—the largest of its kind in the world. Explore the entire collection of sounds, photos, and videos and learn how to capture your own field recordings and share them with the global community. Authors: Thompson, M., Mirin, M., Szuc, J, Warnke, N., and Tosteson, H.
Illustrations: Szuc, J., Greene, V.
Recommended citation: Thompson, M., Mirin, B., Szuc, J, Warnke, N., Tosteson, H., and Greene V., 2018. BeastBox. Cornell Lab of Ornithology.